2-3 T butter and/or bacon grease. 2-3 T mustard. I use Guldens Spicy Brown, but you can use whatever you prefer, including ground mustard powder, which is preferred by my sister, Allison. 1 medium sized onion. (I take medium to be roughly 2.5" - 3" diameter). I use either a sweet yellow or regular yellow/brown onion. In a pinch, you can consider the mustard and onion optional, but I strongly recommend them for the flavor. 1 pint (16 oz) heavy cream. Roughly 1.75 lbs cheese. See discussion of cheeses below. 1 t ground black pepper, or to taste. Cook the pasta. The TJ's pasta I used is rice-based and cooks pretty similarly to traditional pasta, except that I think it has a little more tendency to stick together during boiling. I use an entire 1-lb package. While it's cooking, prepare the cheese sauce per below. Don't forget to stir often while it's cooking. 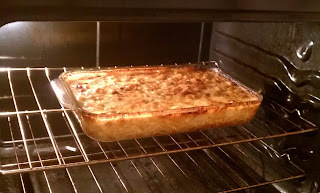 When the pasta is cooked, drain and arrange in greased 9x13 glass oven dish. Preheat the oven to 350. Gently melt the butter/bacon grease in a sauce pan. Ideally, use a double boiler. I've made it many times without a double boiler, and had fine results most of the time (except for the infamous dinner party at deb's when we all get distracted drinking wine in the other room, and the sauce got completely ruined. It had to be thrown out and we started completely over). The last time I made it, I improvised a double boiler using 2 sauce pans, and I think the dairy ingredients responded more favorably to the extra gentle treatment it gave. If you don't use the double boiler, do take extra care not to overheat the sauce. Dice the onion and add it to the melted fat. Saute until the onion is transparent. Add the mustard and mix it all together. The next step is to add the cornstarch. Some people would add it directly to the mustard mixture, mix thoroughly, and then add the heavy cream. I have trouble getting it perfectly smooth using this method. I prefer to put about 1/4 cup of the cream into a small dish, while adding the rest to the saucepan. Mix the corn starch and cream in the dish until smooth, then stir it into the saucepan with the other ingredients. Don't forget to add the pepper. Heat gently over medium/low, stirring frequently, and it will gradually start to thicken a little bit. Slice your cheese and gradually add it to the sauce, making sure to reserve some to put on top before it all goes into the oven. I will discuss cheeses below. When all your cheese has been added and melted into the sauce, and the pasta is cooked and arranged into the pan, pour the cheese sauce over it. Use a spoon to poke and push around on the pasta and cheese sauce to make sure the sauce gets all worked down into it, and everything is distributed evenly. Place your topping cheese on top, and put it all in the oven. Bake 45-60 minutes as desired. I like it brown on top and crusty around the edges. 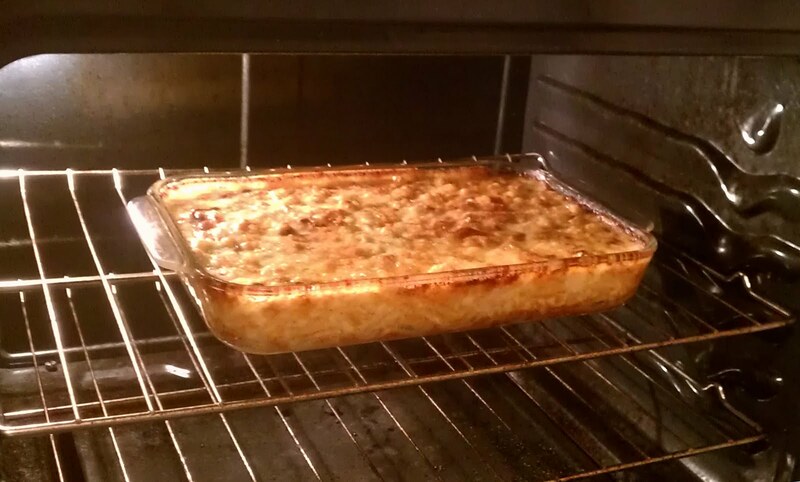 When you take it out of the oven, allow it to settle down for about 10-15 minutes before serving. My latest version was made with about 2/3 lb. each of Brie, Gouda, and aged Cheddar cheeses. For the topping cheese, I used about 1/4 lb. of crumbled Gorgonzola. I haven't really encountered a cheese that didn't work for this recipe. You can make it on the cheap with regular supermarket jack and cheddar, or mix it up with some fancy stuff. Just use whatever looks and sounds good to you at the time. With this recipe, even cheap cheese makes great Mac + Cheese! If you have a favorite version, let me know in the comments. Enjoy!